Scottish photographer Thomas Annan's study of dilapidated housing in the narrow lanes of inner-city Glasgow. 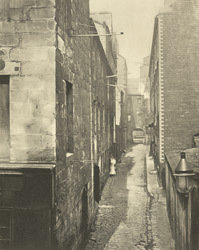 Annan was commissioned by The City Improvement Trust to document the city's slums which were scheduled for demolition and reconstruction by an act of Parliament in 1866. "Although by 1861, Old Glasgow accommodated five times as many people as it had in 1775, the structure of the central city had not changed. By this time the population density in this area was from 500 to 1,000 people per acre. Irish immigration at the height of the potato famine had dramatically increased overcrowding in the centre of the city." Extract from Anita Ventura Mozley's introduction to the Dover Edition of the book 'Old Closes And Streets Of Glasgow'.